Within the controller family, the SIMATIC S7-400 is designed for system solutions in the manufacturing and process automation. The product range comprises 9 Standard CPUs, 2 failsafe and 2 high available CPUs. The S7-400 is especially suitable for data-intensive tasks in the process industry. High processing speeds and deterministic response times guarantee short machine cycle times on high speed machines in the manufacturing industry. The high speed back plane bus of S7-400 ensures efficient linking of central I/O modules. The S7-400 is used preferably to coordinate overall plants and to control lower-level communications lines with slave stations; this is guaranteed by the high communication power and the integral interfaces. The power of the S7-400 is scalable thanks to a graded range of CPUs; the capacity for I/O is almost unlimited. The power reserves of the CPUs enable new functions to be integrated without further hardware investment, e.g. processing of quality data, user-friendly diagnosis, integration into higher-level MES solutions or high-speed communication via bus systems. The S7-400 can be structured in a modular way without any slot rules; there is a widely varied range of modules available both for centralized configurations and distributed structures. 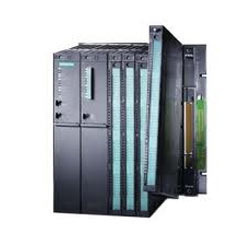 The configuration of the distributed I/O of the S7-400 can be modified during operation. In addition signal modules can be removed and inserted while live (hot swapping). This makes it very easy to expand the system or replace modules in the event of a fault. The storage of the complete project data including symbols and comments on the CPU simplifies service and maintenance calls . Safety technology and standard automation can be integrated into an S7-400 controller; the plant availability can be increased by the redundant set-up of the S7-400. Many of the S7-400 components are also available in a SIPLUS version for external environmental conditions, e.g. extended temperature range (-25 to 60°C) and for use where there is aggressive atmosphere/condensation. Prosafe Automation Engineering Company, as technology driven group with objectives to provide total power & automation solution. We are the group of Engineer’s having Decades of experience in the field of Automation and Quality Power Supply & Power Conditioning Equipment and Batteries. Our range is manufactured using quality material, procured from trusted vendors of the market. We use advanced and sophisticated machinery in the manufacturing process to deliver immaculate products to our clients. We supply our products all over New Delhi. We also provide tailor made solutions as per the specified needs of our valued clientele with observation to control automation, requisite temperature in equipment, material used and many others. Our firm has achieved recognition for providing total solutions for Electrical Systems, Industrial Automation, Industrial IT Solutions and Industrial Networking. We possess a sound and advanced infrastructure through which, we are able to meet the diverse needs of our clients in most effective manner. Understanding the growing requirements of our clients, we design and develop our range according to that only.